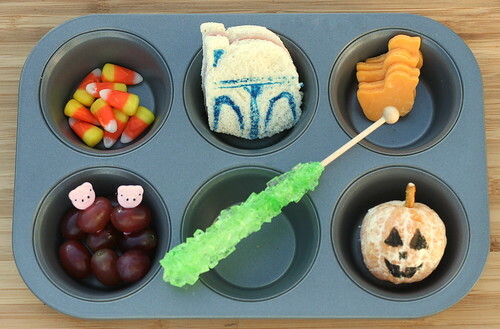 another lunch: Muffin Tin Monday - trick or treat! 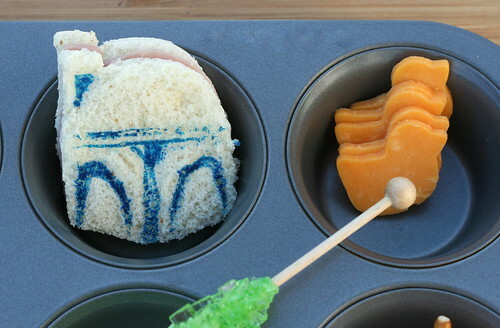 The Boba Fett sandwich was made using a Williams-Sonoma cookie cutter, from the same set his Darth Vader grilled cheese and cheddar Yoda came from! I just used a few strokes with a food-safe marker (General Mills brand) to bring out some of the detail the cookie press makes. I had to show you the reverse side of these cute piggie picks! They have a curly tail on the backs, just like the curly piggie tail on the back of Paige's costume. Tee-hee! So cute! 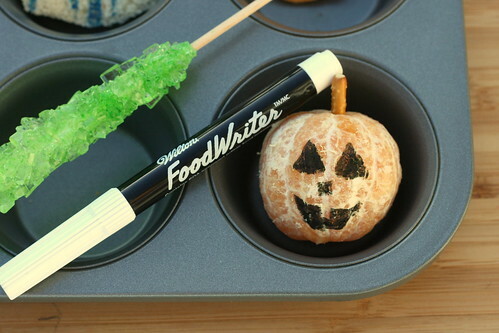 The clementine was turned to a jack o' lantern with a food-safe marker and a little piece of pretzel stick was used for the stem. I've been using this black food-safe marker quite a bit lately and I keep getting questions about what I'm using - this is it! :) It works better on some things (such as the witch grapes and this clementine!) than others (like cheddar cheese jack o' lanterns). It was fun to see what your children will be wearing. What a creative lunch! I love the piggie picks. That's it. I couldn't take it anymore. I just dropped $60 at William Sonoma on Star Wars cutters/molds. Following your blog is getting very expensive!! LOL. My 6 year old Star Wars freak is having a birthday in 3 weeks and I have plans to make it a star wars day from breakfast to dinner. I think he'll be delighted! Thanks for the inspiration. Love the trick-or-treat theme! Candy corn...yummmmm! So cute! I've really got to get a food safe marker! My 2 year old was a piggy last year and it's the cutest thing ever! She still asks to wear her costume! Kryptonite! How clever. Another very creative muffin tin with lovely colors. I look forward to seeing yours! The back of the pick is too cute. Love the tail! Aw, how cute! I love the kryptonite idea! I also have to get me a food safe marker, they are so much fun! I love how you themed your tin this week, besides being yummy it's very creative! How did you make the kryptonite? Cute! Where do you find all of your food picks? 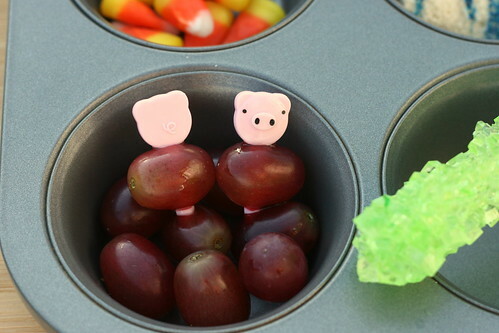 that is a fun idea, serving food in a muffin tin! I think I should introduce a muffin tin monday too!